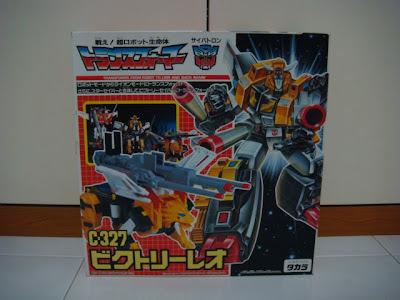 Released in 1989, Victory Leo transforms into a black, yellow and white winged lion robot. Both modes are dominated by the missile-firing V-Lock Rifle that rises from his back between his wings in alternate mode, or plugs into his hip in robot mode. Victory Leo can also combine with Star Saber to become Victory Saber, which was available as a giftset. I have seen the Victory Leo and Star Saber giftset before. Do you have it or still on a journey in search of it?